The first major leak about the NVIDIA GeForce Titan has just happened and its not a picture or new details about the card but actual listing of the GPU itself. 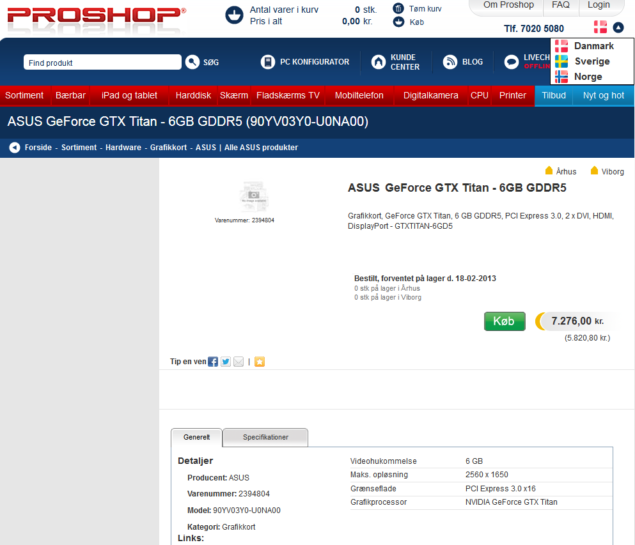 VIdeocardz managed to dig in through retailer Proshop who had put up an ASUS GTX Titan 6 GB GPU lisiting for a price of 7.276,00 kr (€900, $1300). Although the link has been taken down but we were still able to grab a screenshot to show what was listed on the website. The listing actually confirms most of the details we reported about the GeForce Titan that the GPU woul be called simply the “GeForce GTX TItan” whereas some tech sites still use the GTX 780 branding for the Titan. Another conformation is the use of 6 GB of GDDR5 memory along the GeForce Titan board. The card features PCI Express 3.0 compatibility and has 2 x DVI, 1 HDMI and 1 Display port. This is the same configuration as found on most of the new Kepler 600 series GPUs. Other specifications show that the card has 2688 Cuda Cores and even though an ASUS GPU would entirely use the reference design provided by NVIDIA for the GeForce Titan. This is similar to what NVIDIA did with the GeForce GTX 690, limited voltage control and no custom variants of the card. Furthermore the price of the particular ASUS GeForce Titan 6 GB is said to be $1300 US which is quite a hefty price and puts it on a comparable level to the ASUS ARES II which is available for $1200 US. Well we expect the price to be a bit lower around the $899 US mark and since this is an early listing it could probably be a false price. As for launch, sources are indicating a release of GeForce Titan around 24th February – 26th February. This isn’t that far away much and expect more details as launch nears.